Susan will be participating in an International Festival of Authors event at Harbourfront on May 29th at 7:30 pm in the Brigantine room. Host Nora Gold will be moderating a panel of authors on the topic “When Women Write.” Other panelists will be C. Fong Hsiung, Tehmina Khan, and Loren Edizel. Busy month with lots of readings from the new book of poetry, What We Carry, coming out from Signal Editions! spring titles will be in Toronto at the Monarch Tavern on April 24th at 7:00 pm and in Montreal at Drawn and Quarterly on April 26th at 7:00 pm. The other poet will be James Arthur, reading from The Suicide’s Son, and Lesley Trites will be reading from her translation of Aphelia, a novel by Mikella Nicol. In Toronto, Susan will be reading at Pivot on April 11th and at The Art Bar on April 23rd. The other poet will be James Arthur, reading from The Suicide’s Son; David Homel will be reading from his new novel, The Teardown, and Lesley Trites will be reading from her translation of Aphelia, a novel by Mikella Nicol. The other poet will be James Arthur, reading from The Suicide’s Son; David Homel will be reading from his new novel, The Teardown, and Lesley Trites will be reading from her translation of Aphelia, a novel by Mikella Nicol. Susan signed and gave away 25 copies of The Discovery of Flight at the Literary Press Group booth at the Ontario Library Association Super-Conference on February 1. It is always so much fun to meet librarians! NEW BOOK ALERT!!! NEW BOOK ALERT!!! NEW BOOK ALERT!!! Susan has a new collection of poetry, What We Carry, coming out from Signal Editions in April 2019. This will be her seventh book of poetry with Signal and her fifteenth book overall! Genius designer David Drummond has worked his magic again with this cover. Susan participated in a panel discussion titled “We Need Diverse Books” at the Ottawa Public Library’s “Teen Fest” on Saturday October 27. Fellow panelists were Tiffany D. Jackson and Star Spider. Susan read from her new YA novel, The Discovery of Flight, at the “Teen Spirit” Stage at The Word on the Street, Toronto’s outdoor book festival, held at Harbourfront on Sunday, September 23rd. Composer Ronald Beckett set Susan’s extinction sonnets as choral songs performed at the Arcady Ensemble‘s summer concert on June 9th. So thrilling! The same poems also came out in the July/August “Summer Reading” issue of The Walrus Magazine. The Discovery of Flight, Susan’s new YA novel (and 14th book) was launched with Inanna’s spring list at The Women’s Art Association of Canada in Toronto on the evening of May 3rd. Please admire this gorgeous cover! Susan participated in a tribute to the late poet Don Coles at the Free Times Cafe on Friday, February 16th. Other readers include Michael Redhill, Richard Sanger, Steven Heighton, David O’Meara, Laura Lush, and Al Moritz. Robyn Sarah participate by video. On October 1st at 3:30, Susan participated in the launch of the Guernica anthology, The Heart is Improvisational, edited by Carol Lipszyc, at the Supermarket in Toronto. Ronald Beckett, resident composer of The Arcady Ensemble, set Susan’s poem “The Woman beside the Lake Is Reading” to music. It was sung beautifully by Nicole Dubinsky – accompanied by piano, cello, flute and electronic keyboard – on Saturday October 14th as part of the “Voices of Autumn” concert in Brantford, Ontario. Susan spent this month doing the illustrations for The Discovery of Flight, a YA novel coming out in Spring 2018 from Inanna! Here is a sample. IF THERE SEEM TO BE FEWER EVENTS POSTED HERE THAN THERE USED TO BE, this is because Susan has been a full time student at The Art Centre at Central Technical School in Toronto since September 2015. This is her first attempt to combine her literary and artistic pursuits. On April 22nd, Susan gave a talk about the poetry of Primo Levi and Paul Celan at Congregation Darchei Noam in Toronto. Susan was interviewed by Len Pearl about Esther Brandeau, the protagonist of her novel The Tale-Teller, for a film about the history of the Jews in Canada. Will update when I have further information. On Saturday, November 5th, Susan participated in a panel discussion about murder mysteries at the Wild Writers Festival in Waterloo, Ontario. On April 4th, for International Poetry Month, Susan joined Eva Tihanyi, Andrea Thompson, and Patricia Kenney at a reading at beautiful Niagara College in Niagara on the Lake. On Wednesday March 30th, Susan competed in – but sadly, did not win – the 8th Annual BATTLE OF THE BARDS presented by IFOA Weekly at the Brigantine Room, 235 Queens Quay West, Toronto. On Tuesday March 8th, Susan read with Robert Priest at the Boneshaker Series at the St. Clair-Silverthorn Public Library, 1748 St. Clair West in Toronto. On February 21, Susan read from her latest novel, Safe as Houses, at the Junction Reads series at the Magic Oven in Toronto. Other readers were Jess Taylor, Jean-Marc Ah Sen, and Susanne Alyssa Andrews. Mercredi le 2 décembre, Susan a assisté au Salon de Livre de Toronto à la Bibliothèque de référence de Toronto pour signer Les Aventures étranges et surprenantes d’Esther Brandeau et la série jeunesse d’Élisabeth. Samedi le 5 décembre est diffusée un entrevue avec Susan pendant une émission spéciale Salon du livre. The last of the Lunch Bunch trilogy — Élisabeth à la rescousse — is now available in French from les éditions du Boréal! On Sunday November 1st, Susan participated in the members’ book fair at Congregation Darchei Noam. Other readers were Marsha Barber, Gail Benick, Renate Krakauer, and Sylvia Izzo Hunter. On Wednesday November 4th, Susan read with Andrea Thompson and Safia Fazlul at the Wonderful Women Writers series run by Nora Gold at OISE. On November 17th, Susan read with Robert Wiersma and Gloria Ferris at Wordsworth Books in Waterloo, Ontario. A certain quantity of alcohol was consumed, but we’re not saying how much. What happens in Waterloo stays in Waterloo. Elisabeth dans le Pétrin — the French version of Bernadette in the Doghouse by Christiane Duchesnes — was nominated for a Governor General’s award in translation. It didn’t win but still, just being nominated was thrilling. On Saturday October 17th, Susan had a book table at The Wychwood Barns Farmers Market, named the city’s best farmer’s market by NOW magazine. Buy local and organic literature! On Wednesday October 22nd, Susan participated in Catherine Owen’s book tour for The Other 23 & a Half Hours talking about the importance, for a writer, of reviewing other people’s work. On Sunday October 24th, Susan moderated a lively panel discussion about mystery novels with Danish novelist Sara Blaedel, Ovidia Yu from Singapore, and two Catalan authors, Marc Pastor, and Teresa Solana, at the International Festival of Authors. at TYPE BOOKS, 883 Queen St.W. On Sunday Sept. 27, Susan participated in a panel discussion about crime fiction with fellow authors Dietrich Kalteis, Ian Hamilton, and Giles Blunt at the WORD ON THE STREET. The ever-affable Steven Beattie moderated. is available from Cormorant Books!!! On May 2nd, Susan played bookseller for the day during AUTHORS FOR INDIES at Another Story Bookshop on Roncesvalles. Susan participated in The School of Continuing Studies instructor and student reading series, The Platform, with three former students: Bianca Marais, Thomas Vogl, and Ibukin Aisha Yusuf, on April 16th, at the Black Swan Tavern in Toronto. This yummy chapbook just came out. Elisabeth dans le Pétrin est arrivé de Boreal! Quite charming that “Bernadette in the Doghouse” translates to “Elizabeth in the Yeast-Trough” — but hey, that’s what makes translation the wonderful and mysterious enterprise it is. Susan read poetry at the Plasticine series, January 18th at Pauper’s Pub, in Toronto. Susan read poetry at the Art Bar series, January 20th, at The Black Swan Tavern. Susan participated in a local bookfair at the Wychwood Barns Saturday December 6. 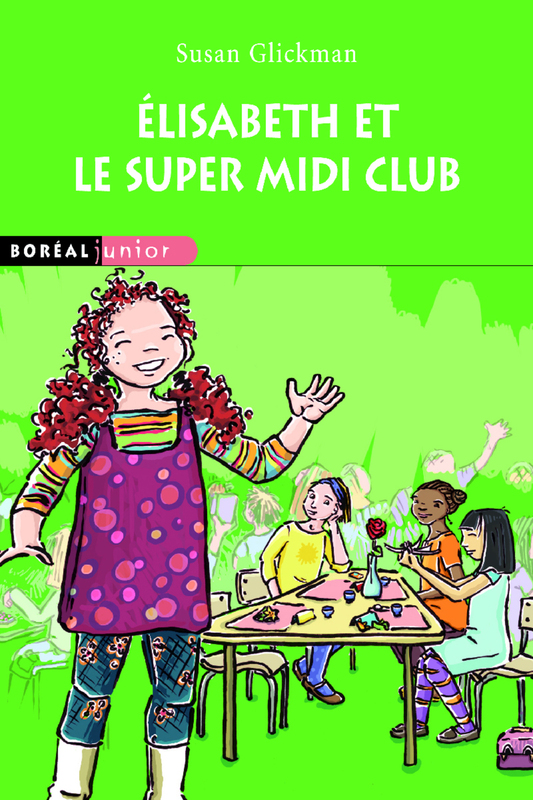 Elisabeth et le Super Midi Club est arrivé de Boréal! NEW BOOK ALERT! NEW BOOK ALERT! NEW BOOK ALERT! Safe as Houses, a mystery set in Toronto exploring the notion of personal security, will be coming out from Cormorant books in the spring of 2015. Susan was the judge for the 2014 “Milton Acorn Poetry Prize” for the province of Prince Edward Island. Susan is delighted to announce that the wonderful Québec press, Les Éditions du Boréal, publishers of Les Aventures étranges et surprenantes d’Esther Brandeau, moussaillon (the French translation of The Tale-Teller) will also be translating her juvenile trilogy, Bernadette and the Lunch Bunch, Bernadette in the Dog House, and Bernadette to the Rescue. Les aventures étranges et surprenantes d’Esther Brandeau, moussaillon, the French translation of The Tale-Teller by the wonderful Christiane Duchesne, is now out from Les Éditions du Boréal! Susan had three amazing days in Montreal and Quebec city promoting the book to the media and to booksellers, who graciously forgave her rusty French and opened their hearts to Esther Brandeau. Closing activities for the inaugural “One Book” program of the Vaughan Public Library System took place on December 8th at the Bathurst Clark Resource Library. Susan talked about the genesis and writing of The Tale-Teller and hot chocolate was served to an enthusiastic audience. SUSAN is delighted to announce that Les Éditions du Boréal will be publishing a French translation of her novel, The Tale-Teller! At 2:00 in the afternoon on Saturday, June 15th, Susan participated in “The Elegy Roadshow,” reading poetry with Tanis MacDonald and Margaret Christakos in Ruth Roach Pearson’s beautiful backyard in High Park, Toronto. On the evening of Thursday, May 30, Susan was the featured author at the Literary Levee fundraiser organized by the Atid Chapter of Canadian Hadassah-WIZO. She talked about the research and writing of The Tale-Teller. On Saturday, April 6th at 1:30 pm, Susan read from The Smooth Yarrow at the annual Richmond Hill Library Poetry Gala. On Sunday, April 7th at 7:30pm, Susan read from The Tale-Teller at the closing night cabaret at the GritLit Festival in Hamilton with Allison Baggio (In the Body), Mark Leslie (Haunted Hamilton), Moez Surani (Floating Life), Matthew Tierney (Probably Inevitable) and live music from multi-talented Gary Barwin and friends. On Friday April 12 Susan gave a writing workshop at the Wellington Public Library as part of the Prince Edward County Authors Festival; on Saturday she gave a reading from The Tale-Teller and participated in a panel discussion on fiction with a great audience at the festival in the beautiful Books & Company store, in beautiful downtown Picton, Ontario. Susan read from The Smooth Yarrow at the Ottawa VERSeFest with Stephen Price and Barbara Langhorst in the “Plan 99” event on Saturday, March 16th at 4 pm at the Mercury Lounge, 56 Byward Market Square. Susan gave a talk about the writing of The Tale-Teller at 7 pm at the Barbara Frum Library, Toronto. On January 31, Susan opened the St John’s Catholic School READATHON by making presentations to the students at two different assemblies, the first for kindergarten to grade 3, the second for grades 4-8. Friday December 7, 6:00 pm – 8:30 pm, Glickman was one of many Susans (Sues, Suzies, Suzannes, Sioux, Susannahs) performing at the Toronto launch of Desperately Seeking Susans at the Supermarket Restaurant and Bar in Kensington Market, Toronto. On Thursday November 8 at 7:00 pm, Susan read from The Smooth Yarrow at Drawn & Quarterly bookstore in Montreal with two other Signal Editions poets: Nyla Matuk and Pierre Nepveu (translated by Don Winkler). Tuesday November 20 at 8 pm, Susan read from both her new books, The Smooth Yarrow and The Tale-Teller, at the Thrive reading series in Kingston, Ontario. Her son, Jesse Klein, opened for her with guitar improvisations. Monday November 26 at 6:30pm, Susan read from The Tale-Teller and participated in a panel discussion with Cary Fagan, author of My Life Among the Apes, and Dave Margoshes, author of A Book of Great Worth, at the Jewish Book Fair in Vancouver. On Tuesday November 27th Susan gave a presentation on The Tale-Teller to grades 8-9 from three Vancouver schools. On Thursday November 2, Susan gave a plenary presentation on the writer’s life and three poetry writing workshops to grades 4 and 5 from three Vancouver area schools. On Friday November 30, Susan read from both The Smooth Yarrow and The Tale-Teller to students at Grant McEwan University in Edmonton. Susan read from The Tale-Teller at Type Books at 883 Queen Street West in Toronto on Tuesday October 23 at 7:00 p.m, with authors Missy Marston, author of The Love Monster and Mark Frutkin, author of A Message for the Emperor. On October 30, Susan participated in a marathon reading from 7:30-9:30 pm to celebrate The Toronto Women’s Bookstore at 73 Harbord Street, which, sadly, is about to close. The official launch was held on September 20th, at the beautiful Nicholas Hoare bookshop, 45 Front Street East in Toronto, from 6-8 pm. Susan read from the “Lunch Bunch” books at the children’s area of the wonderful Eden Mills Festival on Sunday, September 16. Susan signed The Tale-Teller at the Cormorant Booth at Word on the Street, at noon on Sunday, September 23rd. Susan read poetry at Pivot at the Press Club on May 11th, as a former Montrealer, with current Montrealers Stephanie Bolster and Darren Bifford. A couple of poems from The Smooth Yarrow and photo of the author appeared in the Montreal Gazette June 16.
a) Launching The Smooth Yarrow at the Wychwood Community Gallery on May 10th, 7-10 pm, SO much fun, so many friendly faces, and an amazing cake in the shape of a pile of books, courtesy of the sweet and generous Kelly Peterson. some of the audience at the Barns! b) Reading from both The Smooth Yarrow and my upcoming novel The Tale-Teller at the 2nd annual conference of the Canadian Creative Writers and Writing Programs down at Humber College on Saturday, May 12th. Susan gave a reading from new work at the Draft Reading Series at 2 pm on Sunday, April 22, at the beautiful S. Walter Stewart Library in Toronto. Remember to change your clocks forward by one hour at midnight on March 10th. And something else to put the spring in your step: Bernadette to the Rescue is coming your way! On Friday February 3rd at 10:30am, Susan signed Bernadette in the Doghouse at the Ontario Book Publishers Organization booth at the Ontario Library Association Super Convention down at the convention centre on Front Street in Toronto. She also made a short presentation about the book as a member of CANSCAIP (the Canadian Society of Children’s Authors, Illustrators, and Performers). In case you didn’t hear, I was not the winner of the Montreal Poetry Prize and its fabulous booty ($50,000). Guess I won’t be putting new windows in the house after all. On the up side, I was introduced to the work of many poets I wasn’t familiar with, including the winner, Australian Mark Tredinnick, and an American writer named Robert Wrigley. This is the largest prize ever offered for a single poem; a tactic presumably designed to get a little respect for an art form too often overlooked in contemporary culture. An international panel of judges has weeded through thousands of poems sent in from all over the English-speaking world to arrive at the shortlist of 50 from which UK poet Andrew Motion will pick the final winner in early December. On Finding a copy of pigeon. Two poems – “Cold Pastoral” and “On Finding a Copy of Pigeon in the Hospital Bookstore” – made it onto the long list of the Montreal Poetry Prize. On September 22, Susan read her essay from Slice Me Some Truth at the Wolsak and Wynn launch at Ben McNally Books. On Sunday September 25 at 1:30, Susan signed copies of the second “Lunch Bunch” book, Bernadette in the Doghouse, at the Second Story booth at WORD ON THE STREET. Susan read at the Art Bar in Toronto with Carla Hartsfield and Rachel Zolf on May 24. There probably were all kinds of scintillating events I should have noted since December, but I couldn’t get onto my web-site to update and no longer remember what I did! I promise to keep this page more up-to-date from now on. Susan read at the legendary Yellow Door Coffee House in Montreal on December 2. On May 21, Susan read at a gala literary fundraiser at Ryerson University to launch the Motherhood Institute. Other readers included Miriam Toews, Afua Cooper, and Rishma Dunlop. Susan read at the Parliament Street Library on Tuesday, April 6th with Adam Sol and Olive Senior. THE TALE-TELLER, A Canadian Novel of Swashbuckling Adventure, has been accepted for publication by Cormorant Press for 2012 publication. Thanks to my agent, Alisha Sevigny of The Rights Factory, for arranging the deal. THE SMOOTH YARROW, my sixth collection of poetry, is to be published in Spring 2012 by Signal Editions of Vehicule Press, publishers of my five previous collections. Bernadette and the Lunch Bunch receives a starred review in Best Books for Kids and Teens 2009, from the Canadian Children’s Book Centre!! On Sunday January 18th, Susan read at the Side Space Gallery, 1080 St Clair West, in conjunction with the opening of the “Life in the Cemetery” Exhibition, and then at the Plasticine Reading Series. A poetry double-header! Will wonders never cease? Margie Wolfe, publisher of Second Story Press, announced that Bernadette and the Lunch Bunch has inspired her to create The “Gutsy Girl” Series. Susan appeared live on CFRU radio, Guelph, November 29, interviewed by host Kyle Mackie on “Kidstime.” The topic was lunch. Susan’s first children’s book, Bernadette and The Lunch Bunch, has just been published by Second Story Press. Go buy it. NOW! Susan visited the book club at Holy Blossom synagogue in Toronto on May 13 to discuss her novel The Violin Lover. This month she also attended the Writers Union of Canada AGM and admired the hard work done by so many of her colleagues to improve the lot of writers in Canada. Susan was invited by the CNIB to record The Violin Lover as a talking book for the blind. Sitting in a little recording room by myself, reading the whole book out loud from beginning to end, was a very cool experience. It was as though I’d never seen the text before. The Violin Lover wins the fiction prize of the Canadian Jewish Book Awards! The awards ceremony, with speaker Robert Fulford, champagne and strawberries, took place June 21 at the Leah Poslun Theatre in Toronto. The Violin Lover makes the longlist for the ReLit Award. Three years ago Running in Prospect Cemetery was nominated. Maybe this time I’ll get lucky! Reading to and discussion with residents of Shalom House in Hamilton, February 8; including a long-lost relative I found through writing The Violin Lover! Book Club discussion with members of Congregation Darchei Noam, Toronto, January 27. My first experience of discussing The Violin Lover with people who’d actually read it — what an honour! “Books and Bagels” reading and discussion at the Miles Nadal Jewish Community Centre, Toronto, December 3. Excellent coffee. Excellent questions from the audience. And happily, no gate-crashing drunks. Fiction reading with Alan Cumyn and Goran Simic at the GritLit Festival, Hamilton, November 5. An added pleasure was enjoying the wonderful exhibits at The Art Gallery of Hamilton, where the event was held. Group poetry reading November 19, and a presentation of The Violin Lover with music by violist Macey Cadesky and violinist Agnes Klinghofer at the Vancouver Jewish Book Fair, November 20. My dream reading! A dialogue between literature and music. Mozart and Bach mostly. Solo Reading at the Winnipeg Jewish Book Fair, Winnipeg, November 21. The JCC is a beautiful place. Unfortunately, I didn’t have time for a swim. Fiction reading with Camilla Gibb and Yann Martel at the Blue Met Festival, Montreal, April 8. Launch of The Violin Lover at Nicholas Hoare Books, Toronto, March 22. You should have been there! An itinerant boozer crashed the event, demanding a drink. When we asked him to leave, since this was a private party, he retorted grandly “I AM a private party” and absconded with a two-litre bottle of red wine.